New Jersey Gov. 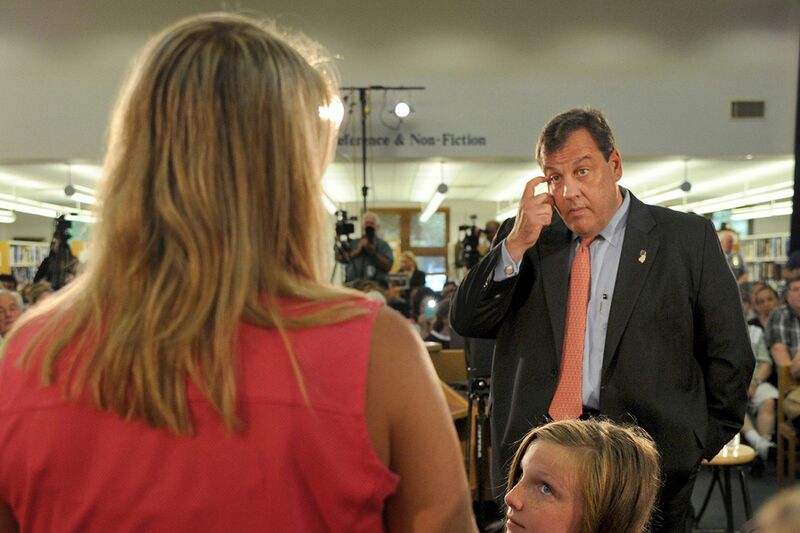 Chris Christie takes a question from Betsy Cross of Wall, NJ, as he holds his first public forum pressing for support of his "Fairness Formula" school funding plan June 28, 2016 at the Wall Township branch of the Monmouth County Library. Pitching his plan to revamp New Jersey's school funding system to residents last week in Monmouth County, Gov. Christie dismissed assessments of his proposal as "radical." "This radical idea that everyone be treated the same," he told the crowd in a Wall Township library. "We've had 30 years of treating people differently, and we've had nothing but failure for it." Christie's proposal to give school districts the same amount of aid per pupil would be a departure not just from New Jersey's system - which is grounded in a series of state Supreme Court rulings directing more aid to needier urban districts - but from the approach adopted by the vast majority of states. "No one does that right now," said Mike Griffith, a school finance strategist with the Education Commission of the States, an interstate compact on education policy. "The main reason is it disproportionately benefits wealthy school districts." Apart from how much per pupil aid the state would award, certain details about Christie's proposal - which has been written off by Democrats who lead the Legislature - are unclear. He has said the state would "continue to provide more" for special-needs students, and that special needs "doesn't just mean developmentally disabled." Asked how Christie's plan to provide special-needs funding would differ from the state's current formula, which is weighted to provide additional aid for at-risk students and English-language learners, a spokesman for the governor said "special education would be outside the same-amount-per-pupil formula." Christie's proposal has drawn criticism, including from some right-leaning education-policy experts. Eric Hanushek, a senior fellow at the conservative-leaning Hoover Institution, said even if increased funding to New Jersey's urban districts had "not led to much in the way of achievement gains, it is not clear that dramatic cuts will not hurt." He noted that funding cuts "are often constrained by union contracts, if not state law." Michael Petrilli, president of the conservative Thomas B. Fordham Institute, said it was legitimate to debate how to fund schools, but Christie's plan was "so dramatic and draconian, it doesn't deserve to be taken seriously." Christie, for his part, has said he does not expect "overnight" change. He frames his plan both as a school-funding reform and property-tax relief measure, and proposes giving each district $6,599 in state aid per pupil. That would be an increase for suburban districts such as Haddonfield - which spent $15,292 per student in 2014-15, with $2,049 per pupil coming from the state - and Cherry Hill, which spent $17,705 per pupil and got $2,958 per student from the state, according to Christie's office. But it would mean big cuts for urban districts. Asbury Park, for instance, received $28,947 per pupil in state aid in 2014-15, according to the governor's office. Camden got $22,975; Trenton, $20,589; and Newark, $18,337, the office said. "Every child should be valued exactly the same way," Christie said in Wall, as he told township residents that under his "Fairness Formula," per-pupil aid for their schools would increase from $3,038 to $6,599, while property taxes for the average household would drop $1,523. Most states take wealth into account when distributing school funding - an idea that began in the 1940s, and gained steam in the 1960s, according to Griffith, of the Education Commission of the States. The intent is to account for disparities between high- and low-wealth districts, which have smaller property-tax bases to draw from to fund schools. In New Jersey, the movement was fueled by litigation: The state Supreme Court's Abbott rulings, which date to the 1980s, have ordered additional aid to urban school districts. The state's current funding formula, enacted in 2008, weights per-pupil aid based on factors that include the number of at-risk students in a district - with more weight for students in districts with higher poverty rates - as well as English-language learners. The state then provides districts "equalization aid," based on their capacity to raise local revenues. To get around the court, Christie proposes changing the state constitution - overriding the clause requiring a "thorough and efficient" system of education that formed the basis of the Abbott rulings. Republican Assembly lawmakers last week announced legislation to put a constitutional amendment on the ballot that would require state aid for students to be on an equal per-pupil basis, "other than special education funding." Democrats, who control the Legislature, have panned Christie's proposal, and even if suburban voters are sympathetic to his cause, "there's no way in hell it will ever get the chance" to go on the ballot, said Patrick Murray, a political analyst at Monmouth University. But the plan is "exactly the kind of thing that would appeal to a certain presidential nominee," Murray said - referring to Christie's prospects in a Donald Trump administration. In Wall last week, Christie said that "we know we're getting shafted" by the current school-funding system, and that changing it would require "breaking some china." But, he would "rather have people uncomfortable than wasting the potential of children," he said - arguing that the outcomes achieved in certain urban districts, despite added state spending, were indefensible. Christie singled out a 66 percent graduation rate in Asbury Park - a district spending $33,000 per pupil, he said. Of the higher-spending districts, "let's strip the money away from it . . . [and] force them to make changes," he said. The Abbott districts have made "substantial improvement" in the last decade, said David Sciarra, director of the Education Law Center, which brought the Abbott cases. He faulted Christie for ignoring progress in the districts, and accused the governor of inflating per-pupil spending figures by including pension costs and not adjusting for student need. Christie has drawn criticism for not fully funding the state's current formula. "There is, I think, a reasonable question about what's the end point," said Frederick Hess, director of Education Policy Studies for the American Enterprise Institute. "How much more do some kids deserve than other kids?" Hess didn't endorse Christie's proposal, which he said had received "fair" criticism. But he called it "a way to frame policy choices."